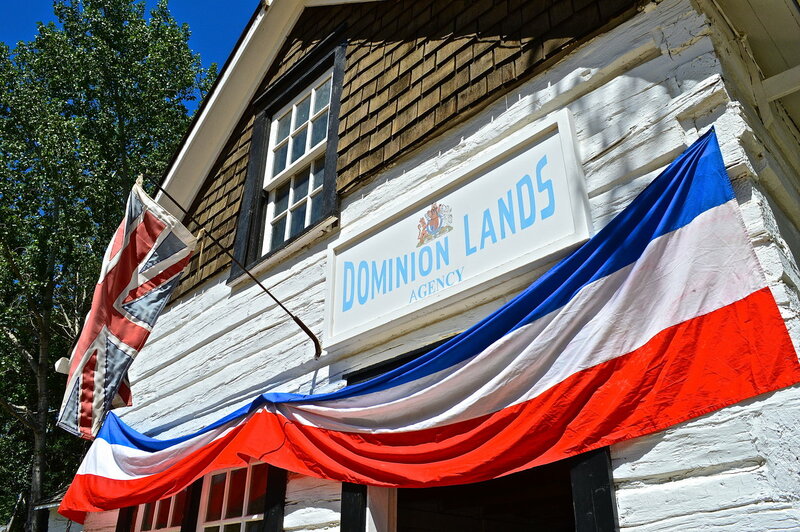 Dominion Day Bunting: I love the word “bunting”. I find it a cheerful piece of vocabulary, although I also associate it the action of booting/kicking for some reason. These are also the colours of the British/Imperial flag, not a celebration of France or the United States, though some visitors do get confused. God save the Queen! 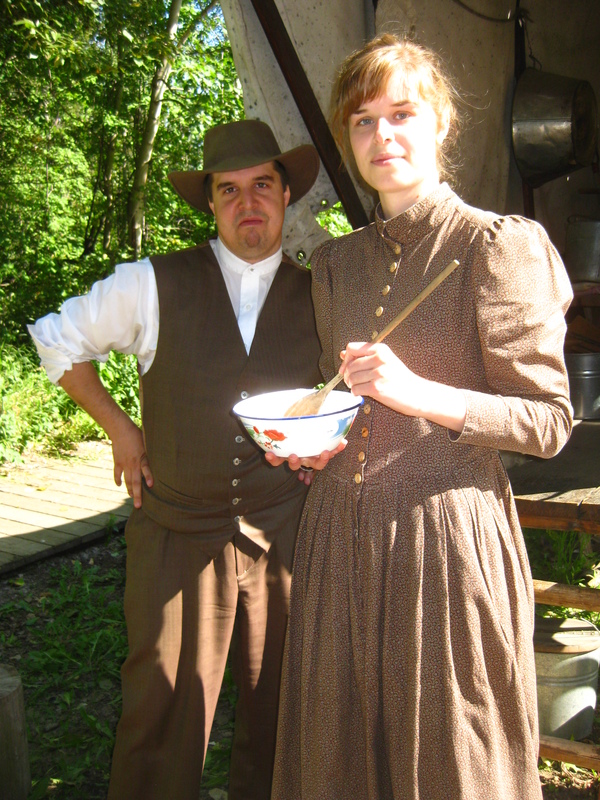 A quick scenario: you’re a costumed historical interpreter at Fort Edmonton Park or another living history museum, wearing a bonnet and petticoat, sitting in front of a chuck wagon and attempting to light a fire with flint and steel. It isn’t going well. One of your esteemed colleagues used up the last of the extremely dry wood the day before and the kindling you have is slightly damp from the rain last night. You have all the ingredients for a delicious batch of drop scones, but you need to get this fire going soon or you won’t be finished in time to help out with another program that afternoon: Glee Club at MacDougall’s church, your favourite. You are the first person to ever tell me that extremely original joke, sir, you can be sure. Photograph by Lauren Markewicz, summer 2012 on 1885 Street at Fort Edmonton Park. How do you respond? Do you acknowledge that you are in fact a twenty-first century kind of gal in costume and explain that you can’t make good scones in microwaves? Do you feign confusion, and repeat the word slowly: “micro…wave?” Do you ignore the comment and greet him as if he hadn’t said anything? You now have a few options. As I have already mentioned, I have seen people at other historic sites repeat the phrase slowly – “text… messages?” and then ask if the person has been in the sun for too long. It doesn’t matter what it is: “micro…wave?”, “eye… pod?”, “astro…not?”, etc. Personally, I feel that is a lazy way out, and it’s easy to sound more condescending than intended. I have seen interpreters do it with some success, granted, but it can easily be overused, especially if all interpreters at the site do it. However, more often, visitors get frustrated with this kind of response, particularly if they’ve heard it from the mouths of multiple people in costume that day. The visitor may also have had a valid question that just has modern terminology; perhaps they were inquiring into how long distance phone call quality and costs may compare between 1920s landlines and cell phone reception in 2013, and by responding with feigned confusion the person in costume is shutting down their curiosity and leaving a legitimate question unanswered. The visitors may also take your inane response as a challenge and try to trick you, the costumed interpreter, into revealing that you aren’t actually from the 1920s and have been deluding yourself. (I never understood what people get of trying to do this, but be warned, it happens often enough.) In any case, feigning complete confusion causes annoyance and unnecessary confrontation on both sides. Interpreters should be continuing a conversation with visitors on mutual grounds, not shutting it down because of one anachronistic comment or word. Because how can a visitor respond to something like a flat denial? You can’t always turn your back on modernity in the historical park (represented symbolically by this grasping modern hand of a visitor). 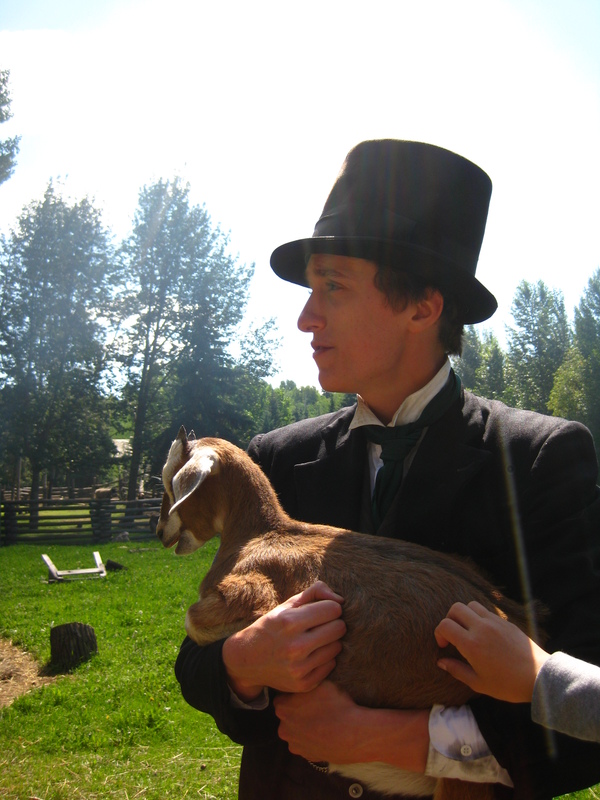 Keep a firm hold on your historical goat (a metaphor for something deep, I am sure), look visitors and their modernity in the eye, and engage them. 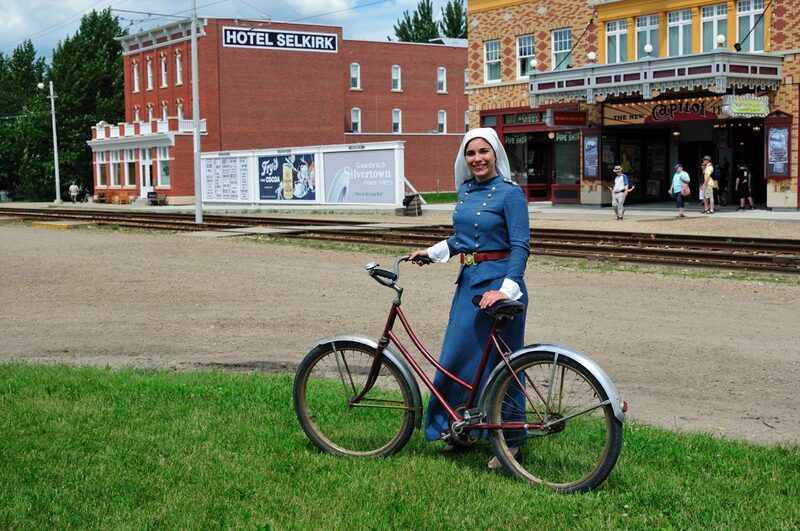 Photograph taken by Lauren Markewicz on 1885 Street at Fort Edmonton Park, summer 2012. “The Saskatchewan District,” was my reply. While the city of Edmonton is now in the modern province of Alberta, before Canadian Confederation when the region of Rupert’s Land was nominally under the jurisdiction of the Hudson’s Bay Company, any HBC forts along the North or South Saskatchewan Rivers were in what was termed the Saskatchewan District. This is something that most in the area during the time period he was interpreting would know, because almost all employees of forts in the West would have to pass through the Saskatchewan District at some point along those very waterways. If nothing else, it dominated maps. “Sas…katchewan? What’s that?” Was his unoriginal response. 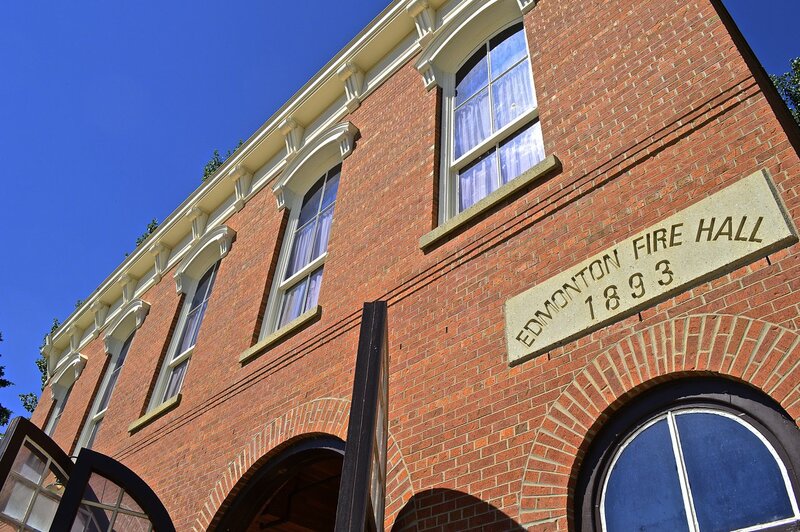 The interpreter continued to deny knowledge of Edmonton. Apparently he was used to asking that question, and his go-to schtick was to point out the fact that he didn’t know such modern places existed. Haha, look how oldey-timey I am! See, that response only works if you know for sure that that a place didn’t exist or wasn’t well known in the era that you are interpreting. Denying the existence of things that did exist in the past, and were common knowledge, doesn’t educate anybody and in fact promotes misinformation, not to mention frustration from the part of the visitor. It also reveals the interpreter’s ignorance of the history that he is supposed to be teaching, making me mentally fact-check anything else he said. 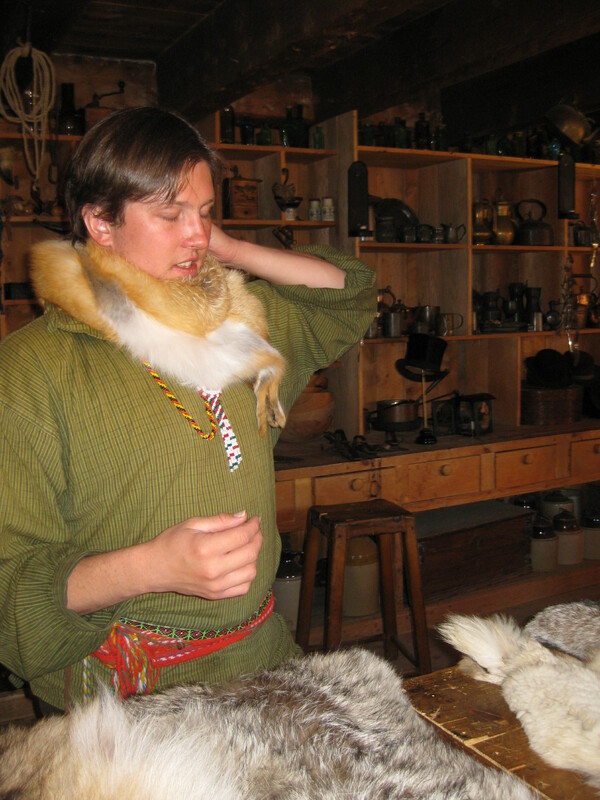 I had been trying to engage him, with a wink and a nod, to say that I too have interpreted the fur trade, working as an employee at a different Hudson’s Bay Company fort. 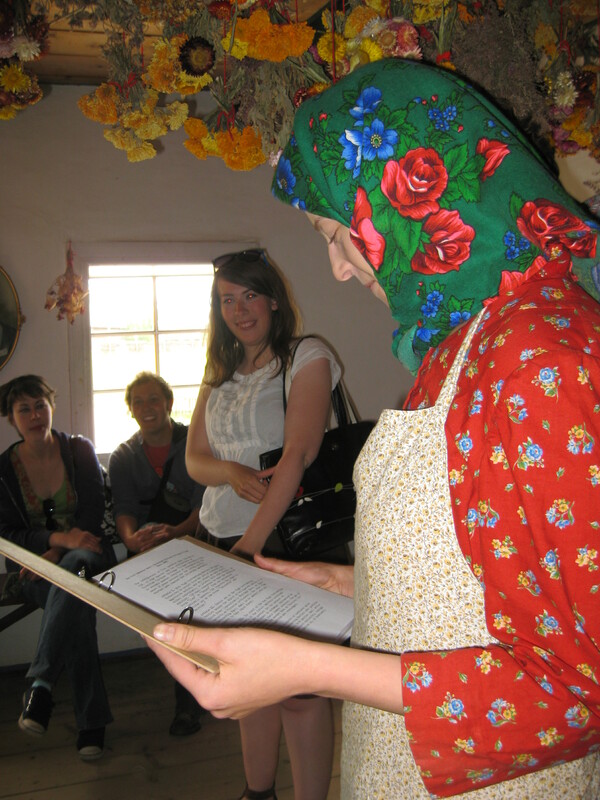 We could have had an amazing conversation that way – I have done so with the interpreters at the Ukrainian Heritage Village North-West of Edmonton, who are very on the ball about sly references like that. They know their history and can run with any metaphorical conversational ball you toss them, using many otherwise innocuous visitor comments, such as where they were from, as a jumping-off point for interpretation. Even if I hadn’t been trying to engage him as one interpreter to another, spouting misinformation about the history of a visitor’s hometown isn’t terribly professional and is not only historically inaccurate but I would even say rude. A skilled interpreter can take something like my response – “I’m from Edmonton” – and respond with something like “Ah, the jewel of the prairies! Have you lived there for many seasons? You know, some of the men in our brigades pass through there on their way to York Factory!” That could then lead into an (in-character) educational conversation about the historical links between this interpreter’s fort and the city in which I lived. I have done the same with visitors who were from Scotland – “Oh, are you new on the brigades? Many of our men are from the Orkney Islands!” – or from Montreal – “You’re not a Nor’wester are you? We don’t like them very much, unless they want to defect to the HBC.” Visitors generally respond very well to getting a bit of their own region’s history linked to the history portrayed at the historical site. Conversations with interpreters who don’t break character don’t have to always be confrontations between present and past. Now, it’s not like every interpreter has an encyclopedic knowledge of world history and geography. But you should be aware of what is happening in your region and around the world during your time period, on a basic level, and feigning ignorance can reveal your own actual ignorance. Your options as an interpreter aren’t stick to your (confused) guns or break character entirely (and “lose”). You should not be competing with the visitor. You can remain in character without acting completely confused and denying the existence of the object or concept. In fact, having a few witty replies can trick the visitor into learning something, even when the visitor’s intentions were to be snarky or combative. 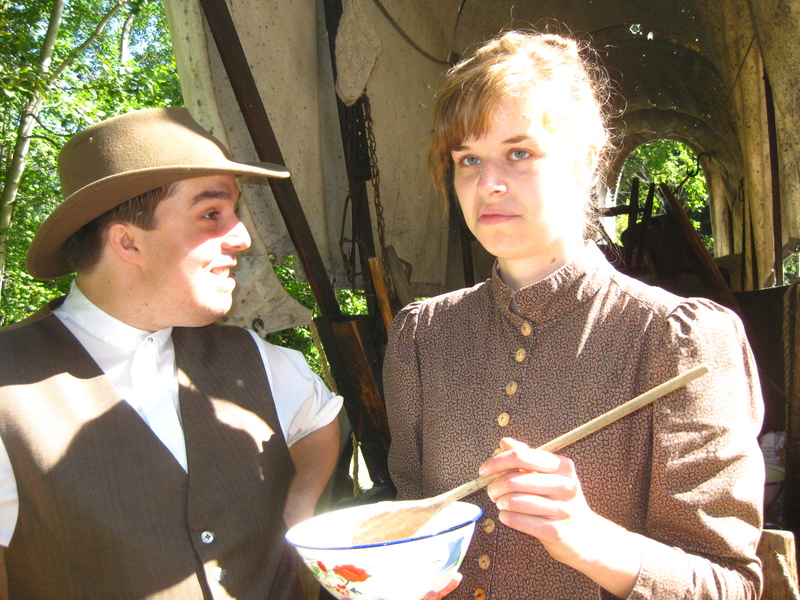 At the Ukrainian Heritage Village, the interpretive staff, who cannot break character, are very adept at playing interpretive ball when confronted with something that doesn’t fit into their historical world view. Photograph by Lauren Markewicz, June 2009. Engaging the visitors in some way is of course the goal. However, I have also seen interpreters whose comments can be seen as a personal attack upon visitors. I feel that the first interaction between an interpreter and a visitor should not be a negative one. For example, I have seen costumed interpreters chastise visitors in short-shorts for being improperly dressed in public. An historically accurate response? Perhaps. Nevertheless, one of the duties of interpreters is to make the visitors comfortable and to give them a pleasant experience. Fashion mores have changed. You should be able to bring it up, and you can do so in-character, but criticism or negative comments should be treated with care. For instance, you can wait to bring it up when prompted by the visitor about the differences between modern and historical clothing; you can be selectively blind until that point about their modern clothing. All people in historical dress are familiar with this question from people dressed in modern clothes: “Aren’t you hot in that?” (As if we need reminding.) That common question is an excellent point to jump in and talk about the practical use of the bonnet as a sun screen, and the fact that having bare skin exposed to bright sunlight can actually make you feel more hot than by having a protective layer of light cotton, or whatever you wish to discuss regarding historical clothing. (I personally love to “complain” about “old-fashioned” fashions that my historical character’s mother would have worn, and point out what makes my particular outfit fashionable by the standards of whatever era I am portraying.) Comparisons between past and present can be gentle and don’t require a verbal attack on the visitor’s fashion choices. Gentle teasing often works far better than aggressive, unsolicited comments about modern clothing. Also at the telephone office: “Don’t you have a cell phone?” / “No, this machine doesn’t run on batteries.” (The “cell” in “cell phone”, as you well know, refers to the fact that it runs off of a cell of batteries, not electricity via a cord like a land line. These were all responses I came up with on the fly, and only had limited circulation later on – mostly when a different visitor made the same terrible joke. 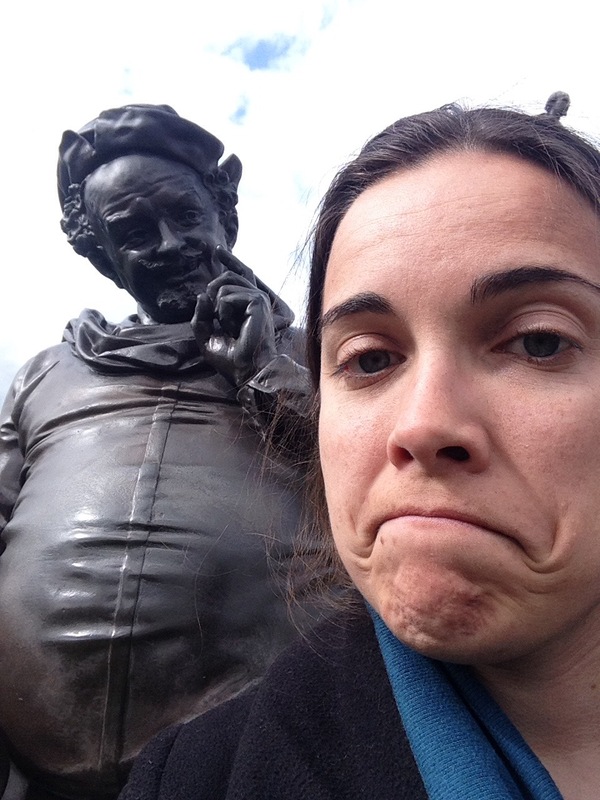 Even if you do have a favourite line – that aforementioned “have you been in the sun too long?” when a visitor speaks about something anachronistic – don’t rely on it too heavily. Be inventive! Come up with other phrases or jokes! Share with your fellow interpreters; even a good line can become stale very quickly if used by multiple interpreters with the same visitor. The fact is, whether their intention is to ask astute comparative questions or to try to force you to break character, visitors by their very definition introduce modern elements into your historical site. You can answer their “modern” questions with a wink and a nod without breaking character. For example, an easy way to ground a visitor in a time period, if your park has different eras, is to make mention of specific events and dates in your conversation, so the visitor isn’t forced to ask you what year it is: e.g., “A few years ago, after the end of the war, you know,” or “We were really pleased to begin the new century with the arrival of the railroad!” Your historical bubble remains unbroken, and the visitor has received the information they wanted and needed. If you want to pursue first person interpretation, it is entirely possible to be engaging and informative to modern visitors with modern perspectives without breaking character in many instances. In general, I would advise you to fit any anachronistic comments made by visitors into your world view without shutting the visitor down. A positive and open attitude is essential. Your response should not be the verbal equivalent of a slammed door, but an open doorway, leading to further discussion and learning. You may notice that these examples provide just such an opening for further conversation. That being said, if the visitor is genuinely being verbally combative and abusive, use your own judgement. You should feel capable of extracting yourself from the verbally abusive situation and finding a colleague; most visitors are not dangerous, but if you feel uncomfortable, don’t stay. You should be supported by your employer and feel safe at your workplace. It is your job to interpret history to visitors, not to be subjected to abusive or belligerent comments or actions. However, most often it doesn’t come to that; I would say that the vast majority of visitors I have had the privilege of meeting are genuinely interested in the past and what I have to tell them. Costumed historical interpreters have to come to terms with the modernity of visitors and react in engaging, educational, and original ways. They may not be wearing bonnets and petticoats, but visitors by their very presence are indicating their willingness to learn history. Don’t shut them down because of an off-hand reference to Sputnik or Angry Birds. 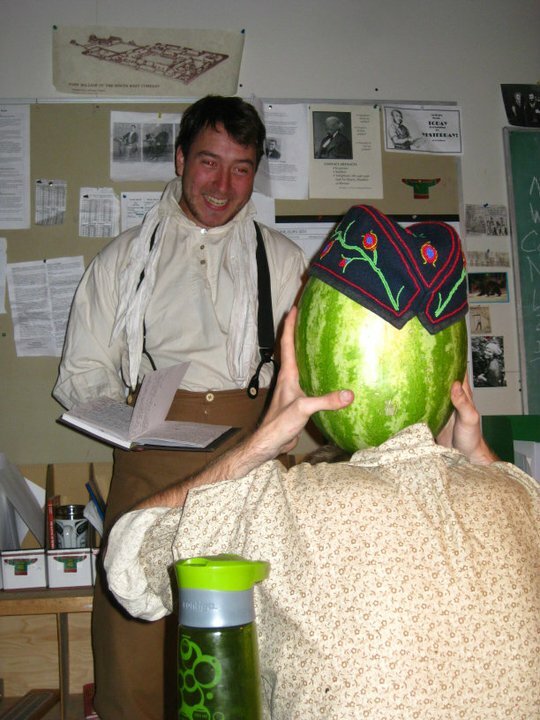 If you are a costumed historical interpreter or re-enactor, I’m sure that you have some metaphorical (or perhaps literal?) war stories to tell. Please share them in the comments below!